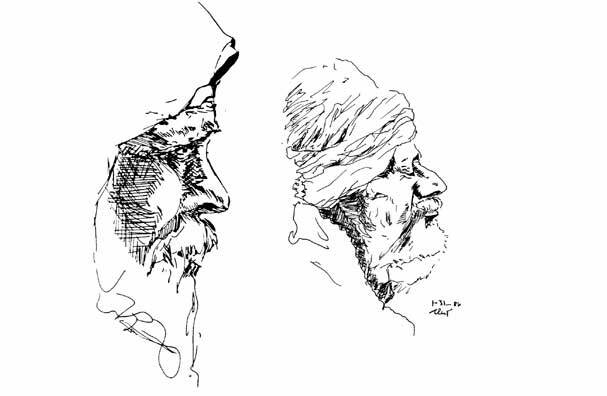 INDIA . . Baba . . .I sit silently on the sidewalk beside the man on the left, who they called Baba. The other man is his companion. We have no common language except grunts and gestures. He seems to be a saddhu, a man who has fulfilled his family obligations, now lives as a holy man, praying, bathing in the river, begging. I decide to join them. I put my backpack and all possessions in storage at a cheap hotel, and return wearing my Bangladesh lungi (skirt), sandals, a shoulder blanket, and a metal bowl, no money.